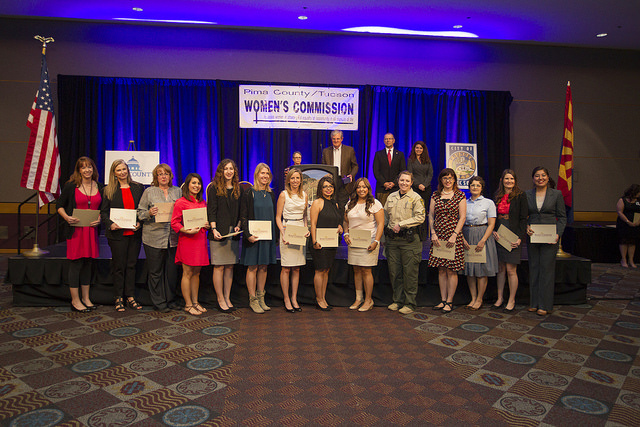 The Pima County/Tucson Women’s Commission honored 11 women employed by Pima County and the City of Tucson at the April 29 Women in Government luncheon at the Tucson Convention Center. Tucson Councilwoman Regina Romero, Pima County Administrator Chuck Huckelberry and Tucson City Manager Mike Ortega were the speakers at the event. County winners and the categories in which they won were: Chris Swenson-Smith, Pima County Juvenile Court, Leadership Award; Sarah Davis, Office of Medical Services, Unsung Heroine Award; Karen Hollish, Health Department, Rising Star Award; and Rosanna Cortez, Lysa Davis and Colleen Phelan, Pima County Attorney’s Office, Synergy Award. Andrea Frank and Jelena Myers, Tucson Police Department, Synergy Award. Kristin Jiroudek, Pima County ITD Project Management Office; Joella Gonzales, Tucson City Manager’s Office Administrative Assistant; and Shirley Muney, Pima County/Tucson Women’s Commission received special recognition for their work. Click here for a Flickr album of photos of the event. Public Fiduciary; Ursula Nelson, Department of Environmental Quality; Lisa Nowacki-Hubble, Superior Court; Sonia Pesqueria, Sheriff’s Department; Josie Sabori, Sheriff’s Department; Chris Swenson-Smith, Juvenile Court; Annie Szalay, Regional Wastewater Reclamation Department. Beth Abramovitz, Department of Transportation; Jamie Brady, Tucson Police Departmen;t Nina Criss, Information Technology; Julianne Hughes, City Manager’s Office; Midge Irwin, Parks and Recreation; Joan Lionetti, Tucson Clean and Beautiful; Yvonne Morken, Information Technology; Maria Robinson, Central Safety Services; Sandra Zurbick, Department of Transportation. MaryJane Abril, Superior Court; Maria Davis, County Attorney's Office; Sarah Davis, Office of Medical Services; Marcy Flanagan, Health Department; Nicole Fyffe, County Administrator’s Office; Lorna Keydoszius, Sheriff’s Department; Elizabeth Koch, Public Fiduciary; Linda Leatherman, Community Services Employment and Training; Jennifer Lynch, Department of Environmental Quality; Mary Martinson, Elections Department; Sherri Mullins, Regional Wastewater Reclamation Department; Anastasia Olander, Regional Wastewater Reclamation Department; Mona Ramirez, Superior Court; Amelia Reyes, Sheriff’s Department; Christina Rheubottom, Kino Sports Complex; Michelle Sixkiller, Juvenile Court; Cary SteeleWilliams, Juvenile Court; Yvonne Suarez, Regional Wastewater Reclamation Department; Judy Tolle, Regional Wastewater Reclamation Department; Monica Wiley, Regional Wastewater Reclamation Department. Patricia Ahumada, Risk Management; Lea Castillo, Tucson Water Department; Josephine Cervantes, Information Technology; Mary Jane Dillard, Department of Transportation; Sarah Durand, Tucson Water Department; Florinda Eberbach, General Services Department; Jolene Hansen, Parks & Recreation; Sarah Haught, Tucson Police Department; Karen Hochede, Information Technology; Edna Jadus-McBee, Parks and Recreation; Brenda Johnson, Tucson Fire Department - Communications; Ann Jones, Budget and Internal Audit; Elizabeth Leibold, Department of Transportation; Jessica Lofgren, Department of Transportation; Virginia Monyak, Real Estate; Ann Moser, Tucson Fire Department; Amanda Munger, General Services Department; Jeannie Nagore, Tucson Police Department; Kelly Nañez, Department of Transportation; Irene Ogata, Planning and Development Services; Lori Pluchinsky, Tucson Police Department; Dawn Schmid, Information Technology; Brittney Spangle, Tucson Fire Department; Shelly Urias, Tucson Police Department; Laura Vittorio, Tucson Police Department; Heather Zapata, City Prosecutor’s Office. Teresa Bravo, County Administrator’s Office; Deirdre Brosnihan, Regional Flood Control District; Renee Carlson, Sheriff’s Department; Lauren Fecteau, Transportation Department; Karen Hollish, Health Department; Michelle Moore, Superior Court; Mirna Oldham, Public Fiduciary; Marcia Ortega-Haro, Health Department; Libby Pilcher, Superior Court; Julie Robinson, Office of Sustainability and Conservation; Michelle Simon, Library District; Kathryn Skinner, Transportation Department; Arielle Stone, Superior Court; Marcia Zamorano, Communications Office. Lorena Baltierrez, Tucson Water Department; Alexandra Frieberg, Tucson Police Department; Megan Green, Tucson Police Department Crime Lab; Marissa Jarvis, Information Technology; Sherry Martin, Department of Transportation. Lilia Alcala, Health Department; Bernadetta Aranda, Health Department; Frederika Espinosa, Health Department; Alice Green, Health Department; Nereida Maldonado, Health Department; Suzy Murphy, Health Department; Luana Pallanes, Health Department; LaTasha Parker, Health Department; Tiffany Riggs,Health Department; Audrey Rogers, Health Department; Rayna Ruiz, Health Department; Velia Valenzuela. Health Department. Patricia Gehlen, Sue Montes, Christie Pierce, Angie Ruiz, Heather Thrall and Russlyn Wells. Andrea Frank and Jelena Myers. Barbara Bacoccini, Alexandra Brown, Monica Felix and Linda Fortuno. Terri Dominguez, Nancy Gradillas and Florence Wilson. 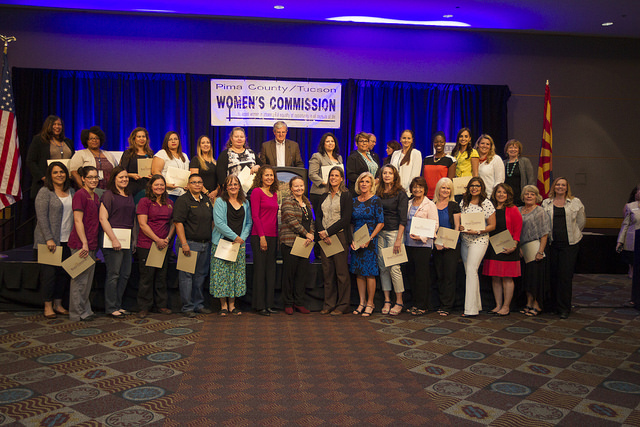 The Pima County/Tucson Women’s Commission was established in 1976 to assist women to achieve equality of opportunity and to take positive action to expose, eliminate, and prevent the practice of discrimination against women. To learn more, see the Women's Commission website.